This is my wife's watch. 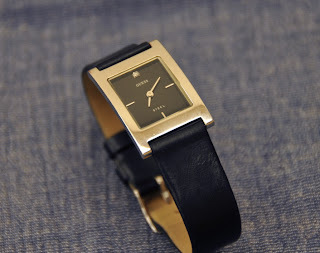 If you have been following my blog, you would already know the watch. It is the one where I blundered the battery change. 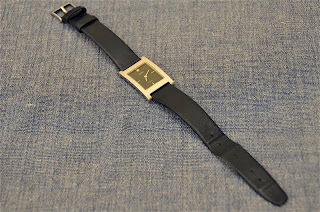 Anyway, I don't remember how old is this watch and a search of the Internet has not provided any clues. The case is made of 2 parts, the main body and the case back. The entire case, case back included, is made of stainless steel. The case has a polished finish and the finish is pretty good. The case is also well made. There are no sharp edges at all on the case. The case is curved along the horizontal and it has a 'step down' at the back. The back of the case is straight and not curved. It would be nice if the case back has a brushed finish. At least the scratches would not be so visible. The case back is a snap back case back. 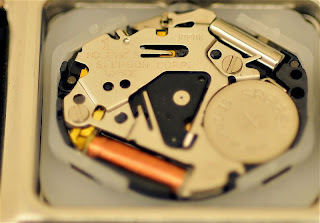 There is a tongue at the 1 o'clock position (looking at the case back) to facilitate removal of the case back. 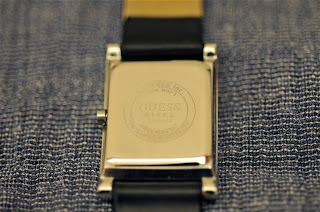 The case back is signed GUESS and below it STEEL to indicate it comes from the STEEL series of watches. Below that is what I believe to be the model number. Around it, at 12 o'clock, we find the legend 'Japanese Mov't' and at the 6 o'clock position 'Water Resistant'. 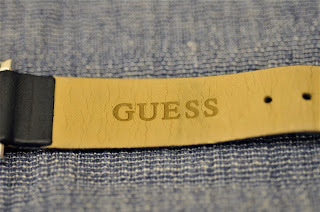 Around that we find two circles and inside the circle we have the Guess website and Guess Inc. The engraving/ etching is fair. If you look at the photographs, you will see that part of the engraving/ etching is not consistent in depth. 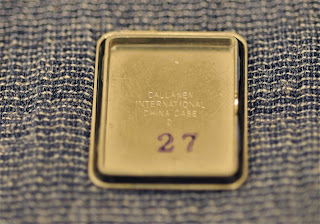 On the inside of the case back we find the following information; Callanen International, China Case, D and the number 27. Callanen International is a subsidiary of Timex Corp. 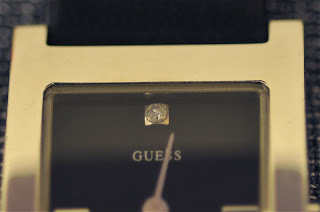 They have an agreement with Guess to manufacture watches for Guess. I suspect the case is also made in China. The crown is a simple stainless steel crown. It is polished. The crown measures 2.5 mm in diameter and is 2 mm thick. It is completely void of any serration. It is smooth all round. It is difficult for me to use the crown, but I guess it is OK for the ladies since I have not heard any complaints from the wife. There is a slight gap between the crown and the case and this facilitates pulling of the crown to set the time. The crown is unsigned. Although the case back says that it is water resistant and there is a rubber seal on the case back, I suspect the water resistant rating for this watch is 3 ATM at best. The watch is powered by Seiko Cal. VX50E quartz movement. The movement is made by Seiko Epson. The movement is made in Japan. It is a basic 2 hand movement with a single position adjustment. The movement has no jewels. The movement has a 5 year battery life. The dial is unique. It has a crystal as the 12 o'clock hour index. There are 3 other hour index markers and they are at the 3, 6 and 9 o'clock position. The dial is matte black and very minimalist. 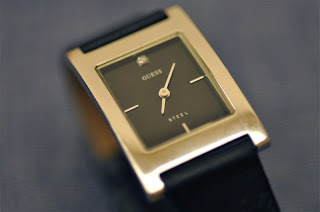 The only markings are the Guess signature at the 12 o'clock position and Steel at the 6 o'clock position. Because the dial is void of any hour and minute markings (except mentioned above), it makes time setting difficult. The dial is also void of any luminous markings. Some say that this could be a problem as it would be difficult to tell the time at night. But in this day and age, how far can we be from a light source. 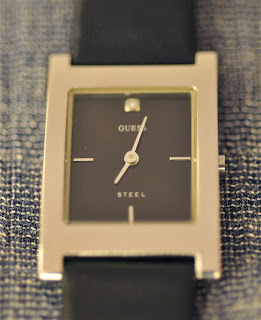 The hands on this watch are also made of stainless steel (I suspect). The hands are polished and the finish and build is good. The hour and minute hand is well differentiated by length. Both hands are not luminous. There is no second hand. It would be nice to have as we can know immediately if the watch has stop working. I suspect the crystal fitted is made of sapphire, but I stand corrected on this. The crystal lacks any AR coating. The crystal sticks out a bit from the case and this could be a problem if the crystal is not sapphire. It would be prone to scratches. The crystal is curved and follows the contour of the case. 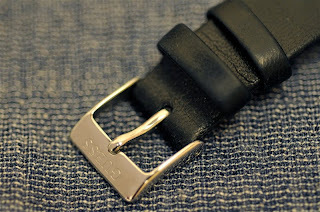 The strap is made of leather. It is matte black on top and brown on the inside. 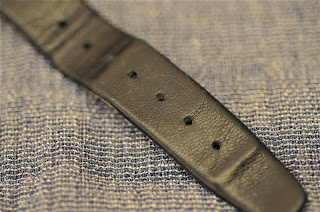 The strap measures 75 mm on the buckle side and 112 mm on the other side. The strap is very soft and very comfortable when worn, so I was told. 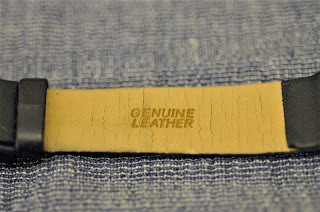 The strap is well made and you can feel the quality. The strap is signed Guess on the buckle side and Genuine Leather on the other. As you can see from the photographs, the backing material has already developed cracks. 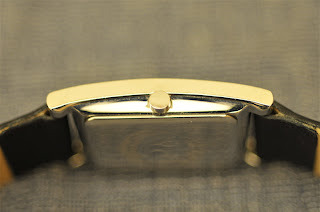 The buckle is made of stainless steel and as with the rest of the watch, it is polished on the outside. The inside is brushed. The buckle is signed Guess. The buckle feels well made. This is a nice watch. It looks elegant and would not be out of place in a formal event. The polished finish and the crystal on the dial gives it some 'bling'. Well my wife likes the watch. It is not too expensive and I think it is value for money.